The celebrated author of The House on Mango Street gives us an extraordinary new novel, told in language of blazing originality: a multigenerational story of a Mexican-American family whose voices create a dazzling weave of humor, passion, and poignancy–the very stuff of life. Lala Reyes’ grandmother is descended from a family of renowned rebozo, or shawl, makers. The striped caramelo rebozo is the most beautiful of all, and the one that makes its way, like the family history it has come to represent, into Lala’s possession. The novel opens with the Reyes’ annual car trip–a caravan overflowing with children, laughter, and quarrels–from Chicago to “the other side”: Mexico City. It is there, each year, that Lala hears her family’s stories, separating the truth from the “healthy lies” that have ricocheted from one generation to the next. 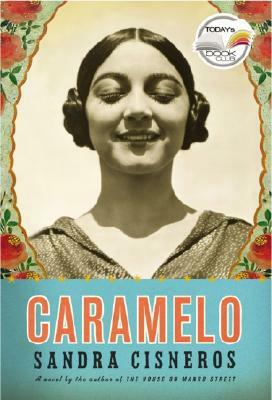 We travel from the Mexico City that was the “Paris of the New World” to the music-filled streets of Chicago at the dawn of the Roaring Twenties–and, finally, to Lala’s own difficult adolescence in the not-quite-promised land of San Antonio, Texas. Sandra Cisneros was born in Chicago in 1954. Internationally acclaimed for her poetry and fiction, she has been the recipient of numerous awards including the Lannan Foundation Literary Award and the American Book Award, and fellowships from the National Endowment for the Arts and the MacArthur Foundation. Cisneros is the author of The House on Mango Street, Loose Woman, Woman Hollering Creek and Other Stories, and a children's book, Hairs/Pelitos. "Writers tell secrets, and in so doing, reaffirm the truths of our lives, the strength of love, the marvel of endurance, and the power of generations. In Caramelo, Sandra Cisneros sings to my blood. Her words are sweet and filling, not sugar-driven but as substantial as meat on the bone. Hers is the kind of family I know well—people who love and hate with their whole souls, who struggle and make over with every generation. She has done them justice on the page; she has given them to us whole." "It's a crazy, funny and remarkable folk-saga of Mexican migrants told by a curious little girl who has the wisdom of an old grandma. Beginning on Highway 66, it's a salsified variant on the Joad family's odyssey, zigzagging from Chicago to Mexico City and back. It's all about la vida, the life of 'honorable labor.' It's a beautiful tale of all migrants caught between here and there." "This book is a crowded train, a never-stop round-trip train going and coming back and going again between Mexico and the USA, across the frontiers of land and time: full of voices, full of music, made from memory, making life."